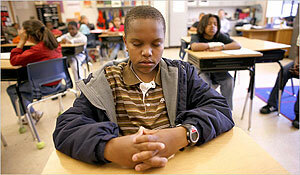 Meditation in schools is not a religious practice that raises any church-state issues. Los Angeles, CA (USA) -- 'At quiet time we try to be as calm as we can," says Reko, a seventh-grader at Ideal Academy, a Washington, D.C., charter school that incorporates a 20-minute transcendental meditation program into each school day. "We close our eyes and think of our mantra so we can be relaxed." On the other side of the country, students at Emerson Elementary School in Oakland practice techniques called "mindfulness" that have been adapted from Buddhism. The children learn to follow their breath, watch their thoughts and focus their attention by listening to the tone of a Tibetan singing bowl until the sound is too faint to hear. "Mindfulness makes me feel marvelous," says Curtis, a fifth-grader at Emerson. Few people doubt that Reko and Curtis -- and thousands of children at charter and other public schools -- can benefit from a daily dose of mindfulness or meditation. Scientists at the University of Massachusetts established the effectiveness of meditation for reducing stress and anxiety in the 1980s. And recent studies at UCLA concluded that kids with attention-deficit and hyperactivity disorders showed clear improvement in concentration and cognitive abilities after learning techniques similar to those used at the Oakland school. These studies have lent credibility to a growing movement to introduce meditation and mindfulness programs into the nation's schools. The number of such programs has jumped from just a handful five years ago to more than 100 at the start of the coming school year. In Southern California, the David Lynch Foundation is sponsoring start-up transcendental meditation programs at two publicly funded schools -- one in Inglewood and another in Sun Valley. As the movement to bring mantras and Tibetan singing bowls to public schools gathers steam, some activists who keep an eye on church-state issues are crying foul. "It's not the business of schools to lead kids to inner peace through a spiritual process," says Edward Tabash, chairman of the national legal committee for Americans United for the Separation of Church and State. Tabash, a self-described secular humanist, predicts an imminent court battle. "I can quite frankly see a coalition between religious fundamentalists and atheists challenging this." Last fall, the Pacific Justice Institute, a legal advocacy group for conservative Christian issues, launched an opening salvo. The institute took up the cause of parents who objected to a TM school program in Marin County, which prompted the Lynch Foundation to withdraw its support. The common rallying point for any anti-mindfulness coalition would be opposition to teaching practices that trace their roots to Buddhism and Hinduism in public schools. Why should mantras and meditation be allowed to slip past the formidable barrier of legal precedent that has largely kept prayer out of the schools for the last 50 years? The short answer to that question: When they're stripped of their Eastern cultural trappings, meditation and other mindfulness techniques are not religious practices, so there's no reason to ban them in public schools. Choral music comes out of Christian church traditions, but no one objects to a school choir. "What's religious about learning to follow your breath?" asks Wendi Caporicci, a devout Catholic and the principal at Oakland's Emerson Elementary. George Rutherford, the principal at Ideal Academy, takes a similar view of transcendental mediation, which he has practiced for over a decade. "I'm a Baptist, and my wife has a doctorate in Christian education," he says, adding that TM "is not a religion." A federal district court came to a different conclusion in 1979. The court said TM couldn't be taught in publicly funded schools in New Jersey because the practice -- with its ties to a specific spiritual leader -- violated the establishment clause of the 1st Amendment. But in the intervening years, the medical study of TM and Buddhist-derived mindfulness techniques has changed both the practices themselves and attitudes toward them. The new "medicalized" meditation and mindfulness programs seem more likely to pass constitutional muster. The Supreme Court has already weighed in on what counts as a religious practice or belief. In United States vs. Seeger (1965), the court determined that a conscientious objector who justified his claim of exemption from the draft by quoting Plato, Aristotle and Spinoza couldn't be compelled to serve in the armed forces because his beliefs occupied a place in his life "parallel to that filled by God." It would be hard to argue that meditation has replaced religion for people like Rutherford and Caporicci. None of the hallmarks of religious systems -- doctrine, cosmology, ethics, clergy, devotion to a deity or reverence for a prophetic teacher -- figure into these mindfulness and meditation programs that are beginning to raise the ire of church-state activists. More to the point, these programs teach skills -- how to pay attention and regulate the emotions -- that many parents and teachers are eager for kids to learn. Without Buddha or Brahma or bowing or incense, meditation and mindfulness are about as religious as -- well, breathing. Are you breathing right now? Just for a few seconds, can you follow your breath as it moves in and out of you? Do you feel your belly rise and fall as you inhale and exhale? As you watch yourself have this experience, do you realize that you've taken a step back from your thoughts and emotions? Congratulations -- you've just aced the final exam for Mindfulness 101. That's it. Class dismissed. Wait -- one more question before you go. Are your dearly held beliefs still intact? It will be the burden of any anti-mindfulness coalition to prove that they're not. Nick Street, a Soto Zen priest, is a fellow with News21, a Carnegie-Knight initiative in journalism education at USC.